While having a round table discussion with Eric Borneman, Brian Plankis, Marc Levenson, and a tiny grouping of local hobbyists (myself included) this weekend after Marc’s aquarium photography discussion, we hit on the topic of the over abundance of lionfish in the Atlantic Ocean and the nearby Gulf of Mexico and Caribbean Sea. I already knew some about the abundance of these fish in their new non-native home, but had no idea how abundant they were until Eric opened my eyes to the reality that never gets discussed. The lionfish, a much sought after fish in the saltwater aquarium trade, is a gorgeous fish with long, decorated fins and unique coloring. 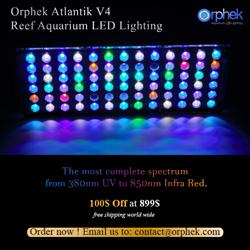 They are highly popular with large fish-only aquariums and even some agressive reef tanks. These fish are venomous and come from various locations in the Pacific Ocean, where their natural predators keep their populations in check. However, due to their popularity among saltwater hobbyists and an absolute lack of their natural predators, the lionfish have become extremely widespread and abundant in Atlantic waters, especially in and around the Gulf of Mexico and the Caribbean. In the wilds of the Pacific, groupers are the major consumer of lionfish. There are groupers in the Atlantic, but the lionfish is not a typical meal for local groupers and other big game. The flamboyant coloring of the lionfish may also pose as an aposemetic warning for other fish to stay away, indicating that it is venomous or harmful in some way. Additionally, overfishing of large predators in Caribbean waters has left almost nothing for the lionfish to fear. 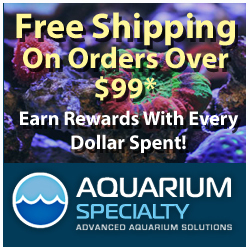 It has been speculated and reported that saltwater aquarium keepers on the eastern coast of the United States, mainly in Florida, have either purposefully or accidentally released a small number of Volitan lionfish into local waters. 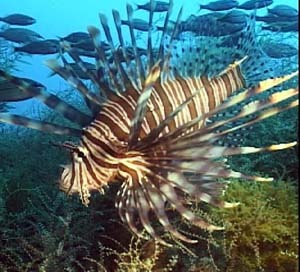 It has even been reported that the entire population of lionfish has come from as few as 6 indivuduals. I don’t recall the specific report I read, but scientists did genetic testing on lionfish caught off the eastern coast of the US and found very few genetic differences between fish. 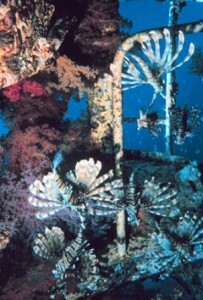 The very small population of lionfish, unchallenged by their new surroundings, eventually bred and exploded in numbers. Today, their numbers are so prevalent that it’s not uncommon to see several on any particular dive. Additionally, these fish have grown quite large due to an abundance of food and lack of competition. Eric Borneman stated that the Atlantic lionfish are significantly larger than the Indo-Pacific lions and that they are so much more abundant. He also described how the fish would hunt schooling fish. Local baitfish do not see the lions as a threat, as they are a newcomer to the area. This allows the lionfish to get close to the prey and easily capture a meal using ambushing tactics. The predator hangs out in seagrasses and among mangrove roots and captures anything passing by. The immediate impact of the lionfish on wildlife is not wholly clear, but it is certain that their population will continue to expand until local predators figure out how to eat them or food becomes depleted. Small fish populations will suffer tremendously which may lead to fewer native predators, possible increased algae growth, and overall less diversity indicating an unhealthy ecosystem. But one thing you can derive from this story is to not release non-native livestock into local waters. Coral magazine also has a great article on this subject. man, that’s one magazine i wish i had a subscription to.